Action Alert— Please call your Congressional Representatives and tell them to oppose 2018 Farm Bill provisions that would ramp up logging on public lands. In another effort to expand lawless and unregulated logging on public lands, congress is at it again—this time with provisions in the Farm Bill that would undermine environmental protections and shut the public out of the review process. The forestry provisions in the 2018 Farm Bill would harm forests, streams, and wildlife. Many of the provisions are being justified under the guise of “fuels reduction”– which is (at best) a misguided strategy that removes important wildlife habitat but does not protect communities. Logging is not restoration! This bill takes us in exactly the WRONG direction. 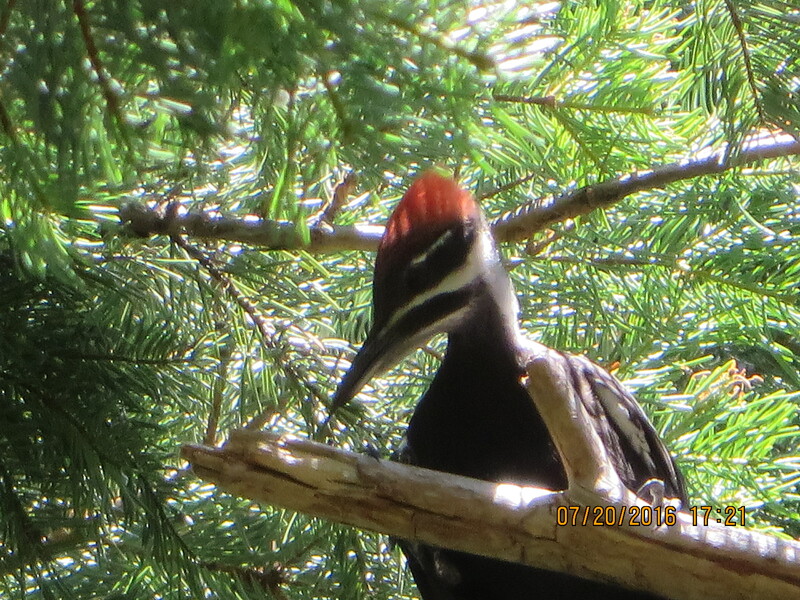 We need more environmental protections, not less! Many forest and stream ecosystems are experiencing negative effects from climate change. In order to give species and ecosystems the best chance for adaptation and survival, large and unfragmented blocks of habitat and connectivity corridors need to be protected– not logged! In addition, more logging will exacerbate climate change by releasing large amounts of CO2. We should instead be preserving forests as a way to capture CO2 emissions. The provisions would include clear-cutting, as well as “salvage logging” of ecologically sensitive and important post-fire habitats. The provisions would also allow restrictions on streamside logging (such as buffers) to be waived during “salvage” logging. This would create devastating and long-lasting negative affects to water quality, fish and other sensitive aquatic species, and numerous birds. Agencies would not have to consider “cumulative impacts”– for example, logging could occur in numerous back-to-back projects, creating massive impacts over large areas, yet the Forest Service would not have to consider the combined impact of these numerous projects on endangered species or any other environmental risk. This has very serious implications for threatened and endangered species, and would gut many of the protections currently in place for at-risk species. The Forest Service would no longer have to consider impacts to Potential Wilderness areas in logging that takes place as part of categorically excluded projects. * Allow logging in Inventoried Roadless Areas through the use of the Categorical Exclusions (CEs) proposed in the bill. These CEs eliminate current requirements to assess environmental impacts (including cumulative impacts) or respond to dissenting scientific opinion and ensure the scientific accuracy and integrity of a decision. * Jeopardize ESA-listed species by gutting requirements for analysis and joint-agency review that were designed to protect threatened and endangered species. The provisions would cripple ESA protections on public lands, and allow for the destruction or degradation of much of the last remaining suitable wildlife habitat for many listed species. Many ESA-listed species are facing habitat destruction and range reduction/shifts due to climate change. They would be at even greater risk of extinction due to increased and unregulated logging. ESA-listed species that would be affected include Canada lynx, Bull trout, Mid-Columbia and Snake River steelhead, Oregon spotted frog, Northern spotted owl, and others. The Forest Service already has a severely bloated road system fragmenting forests and dumping sediments into streams. National Forest lands contain approximately 380,00 miles of road and have a $3 billion maintenance backlog (USFS 2000). * Exempt the use of pesticides from the Endangered Species Act– which would allow for widespread killing of ESA-listed species with pesticides, as well as the destruction of necessary habitat the species depend upon. The use of pesticides– and herbicides, which are a category of pesticides– is unfortunately commonplace and extensive on public lands, and is already putting native fish, plants, and animals at risk of extirpations and extinction. It is unconscionable that members of congress have proposed such a provision, which would allow for the wonton destruction of threatened and endangered species and their habitats. You can see the draft 2018 Farm Bill; the forestry-related provisions begin on page 464. These provisions threaten to devastate forest and stream ecosystems, and increase logging-related carbon emissions. We cannot afford more large-scale and rampant environmental degradation in the face of climate change and alarming losses of species and biodiversity. Act now! Please call your elected representatives in congress to stand up for forests, streams, and wildlife. Tell them that logging is not restoration, and that you oppose efforts to increase logging and shut the public out of the review process. We need more environmental protections, not less! Together, we’ve stopped similar and horrible provisions before. 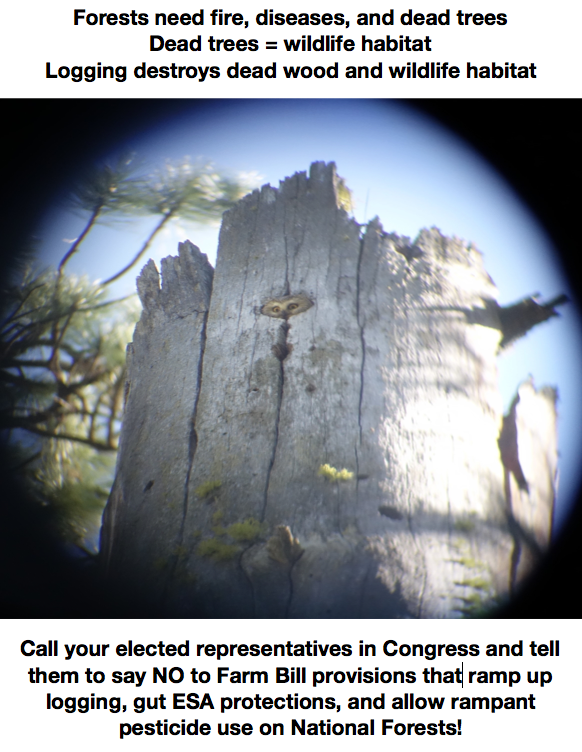 Please stand up for forests again– call your Congressional Representatives! The John Muir Project of the Earth Island Institute has put together a detailed summary of the worst of the 2018 Farm Bill provisions. You can read their very helpful handout HERE. Beyond Toxics has put together a detailed summary of the Farm Bill provisions regarding pesticides; you can read that here.